PUNE: After nearly 18 months, the famed 110-year old Matheran Toy Train resumed partial services on Monday, after it was suspended in May 2016 following several derailments, a top official said. "The train resumed services on the critical Matheran-Aman Lodge sector, around 3.5 km distance. We are planning to restart services on the entire 21-km Neral-Matheran route as soon as possible," Central Railway (CR) CPRO Sunil Udasi told pune-news.com today. From Monday, the CR started 12 shuttles daily on the route. It started from Matheran at 8.50 a.m. and in return direction from Aman Lodge at 9.25 a.m., in what is Asia's only automobile-free hill station nestled in the Western Ghats, around 110 kms from both Mumbai and Pune. To ensure passenger safety, the CR has introduced enhanced safety features in the toy train 'Phul Rani', and replaced the original manual brakes with the safer air brakes system. In the original system, there was a manual braking in which six brake porters applied the brakes in sync and any time lag between could cause an accident. Under the new air brake system, the train driver can now slow down or apply the brakes as required without the involvement of the brake porters. Udasi said that the final trials to check the safety and operational issues before top officials were conducted on Sunday before giving the green signal to resume operations from Monday. The resumption of services would prove a boon to the local residents and tourists to Matheran as the winter peak tourism season has started and they were forced to cough out exorbitant amounts to hire horses or carts. The other option for the able-bodied people was to walk the steep route from Matheran to Dasturi Naka, the termination point for all vehicles outside the hill station precincts. 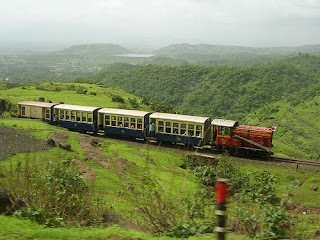 The narrow guage toy train is considered a marvel and ascends in a crazy zig-zag (with more than 280 steep turns) from Neral to Matheran, around 2,500 feet from sea-level, offering breathtaking views of the lush green and steep hills and deep valleys, highlighting the beauty of the hill station. The toy train was built by a Mumbai industrialist, the late Sir Adamjee Peerbhoy at a staggering cost of Rs 1.60 million in seven years, between 1901-1907. The hill railway contributed in a big way to the growth of Matheran and forever changed the face of the tiny hill station, after it was discovered in May 1850 by the then Mumbai Collector Hugh Poyntz Malet.